Jump N Roll HD – Crazy Jumping on the iPad! Posted in Uncategorized | Comments Off on Jump N Roll HD – Crazy Jumping on the iPad! Plopp offers a unique new gameplay while being colorful and relaxing. The game has an incredible flow since everything is changing constantly and you need to make decisions all the time. Plopp is very easy to pick up by everybody and even small kids have great fun with Plopp, just by clicking around and to see how the colorful shock waves expand. More experienced players get really challenging Quests as the game progresses. The first 5 levels with 20 Quests are for free, so give it a try and tell us what you think about it. We hope you’re going to love Plopp the way we do. Posted in Uncategorized | Comments Off on Plopp – Now Available! Our New Action Puzzle Game ‘Plopp’ is coming soon. Would you like to get a Plopp Postcard? ‘Jump N Roll’ Out Now! We adopted the ‘Jump N Run’ genre and optimized it for the iPhone. We reduced the concept to ‘Jump Only’ which allowed us to implement an intuitive one-touch control. So the game is quite simple to pick up, but is really hard to master. Addictive old-school gaming 😉 – Happy jumping everyone! Posted in Uncategorized | Comments Off on ‘Jump N Roll’ Out Now! games2be presented Spoing at the “Imaging the future” which is part of the Neuchatel International Film Festival along with other speakers like EA founder Trip Hawkins. After over a year of intense development games2be and Chillingo present the iOS game Spoing. After the first release of Spoing on Facebook, the game now has a twisted story, cute characters, 3 brand new sound-tracks and lots of achievements and challenges. The game was fun on Facebook, but it is way more fun to play it on a touchscreen device. > Bigger and brighter Explosions! 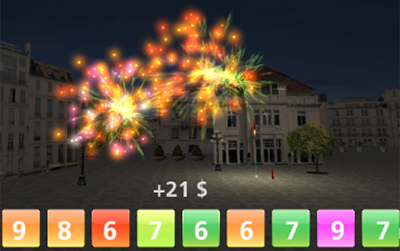 > 10 brand new Bullets, Letters and Numbers -> Write Messages with a Firework! > Daily Gift -> Get free diamonds every day! > New login to save your progress! > New reward-system-> See how much reward you get form each bullet! > Save your firework shows and share them with your friends! Try FireCraft Online Now – It’s for free! 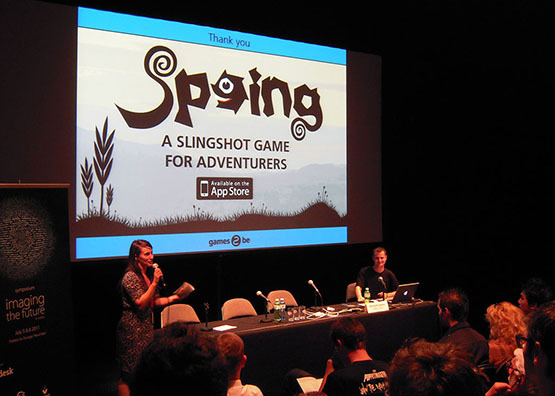 We are proud to announce that Chillingo is our publishing partner for our upcoming iPhone game “Spoing”. Chillingo is the leading publisher for iPhone games and division of Electronic Arts Inc.
FireCraft had been downloaded more than 300`000 times in the iTunes store! We are happy to announce another big FireCraft update today. Please help us with our Kongregate-Unity-Contest by giving us a 5-Star review.